The work is part of a range of works showing moments of buildings under construction where the game of unfinished structure, light and reflection is creating a inspiring athmosphere. In these moments you can get lost in between reality and reflection. I was raised in Leuven (1989) and am living and working in Antwerp, Belgium. 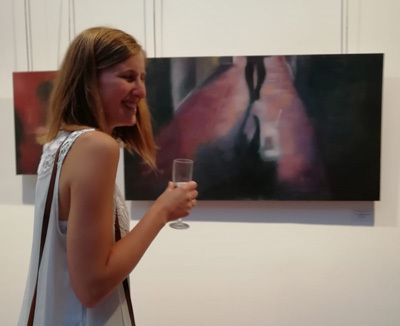 I graduated in 2012 from the Katholic University of Leuven as an Engineer Architect and graduated in 2018 from the Academy of Fine Arts Berchem (partly art education) as a painter. I was doing my EVS at the center for contemporary art in Graz this year when Marina D. Argent, who was doing her EVS at Art Mine, asked met to join See The Big Picture. The atelier of Franz Konrad in Schaumbad – which I could share with him during my stay in Graz – was the inspiring place where I could make these works.